2014 ANU Chess Festival - Pawn Grabbers! Like a lot of people in the chess world, I am heading off to the 2014 Chess Olympiad. When the bid was received from Tromso, it did look quite impressive, but some people did suggest it would be an expensive place to go to. At the time this concern was mainly concerned with the price of alcohol, but it turns out just about everything is pricey. I expect there is going to be a degree of 'price shock' when the masses arrive at Tromso Airport. Getting fed is probably going to be the biggest challenge, if you are not there as a player. The meal package seems to be around $110 a day(! ), for breakfast, lunch and dinner. As this is the first Olympiad I will be attending as a non-player, scouting around for a good hot dog stand may be my best option. Even a load of washing is going to cost $45, so buying new shirts might be the most economical plan. I am leaving tomorrow evening so the usual blogging caveats apply. Light blogging while in transit, with the chance of no posts for a day or two. Stopping over in London both there and back, otherwise it will be 15 days of reporting from Tromso. While the Poltiken Cup is a 300+ player swiss, it did not stop the smaller group of Australian players (6) from occasionally running into each other, at the board. Olympiad team captain FM Manuel Weeks had to play FM Junta Ikeda and IM Moulthun Ly, and scored a credible 1/2. For a slightly younger generation of Australian players this may be a bit of a surpise (as Manuel does not play a lot these days), but he was a strong player when active, and has quite extensive opening knowledge. This knowledge came in quite handing when I roomed with him at a couple of Olympiads, and it was no coincidence that I had my best Olympiad results when he was able to help me with my preparation. Here is the game where he defeated IM Moulthun Ly. Normally the two bishops should beat the rook, but the passers on the edges of the board proved the difference. After 7 tough rounds, the 2014 ANU Open ended in a tie between FM Endre Ambrus and IM Andrew Brown. Brown had lead the tournament with 4/4 after the first day, but a loss to CM Jonas Muller in round 5 suddenly opened up the tournament. However Ambrus almost knocked himself out of contention in the same round, dropping an exchange against Wenlin Yin in an ending. But in a still tricky position, Yin failed to find a clear path to victory and actually lost on time. Ambrus then overcame Muller in round 6, before overcoming some determined resistance from Alana Chibnall in the final round to finish on 6/7. Brown reached the same score by beating Michael Kethro and Clive Ng. Muller finished in outright 3rd on 5/7. The 2014 ANU Open began today, with a much smaller field than last year. Of course the top section was affected by an upcoming tournament in Norway, but I am not sure why numbers are down by 25%. The Open started with 19 players, and is already looking like a tough affair. Top seed IM Andrew Brown finished the first day on 4/4, after dispatching his closest rivals. His round 3 win over 2nd seed FM Endre Ambrus was probably the critical game of the day, with a tactical skirmish ending with a killer night fork. Ambrus still holds a share of second, along side 3rd seed Jonas Muller. Muller dropped a point to Wenlin Yin, but bounced back with a 4th round win over Fred Litchfield. In the Minor event, Dillon Hathiramani and Kayleigh Smith lead with 4/4. Smith, a last minute entrant, said her main goal was not to lose all her games, so clearly she has met that goal! There a 9 players behind them on 3/4, so a win for either in tomorrows round 5 clash will make the the clear favourite to take out first place. At the web page for the 2014 ANU Open, you can find both the results, and replayable games from the early rounds. Results for the 2014 ANU Minor can also be found, although no games as yet. The first event of the 2014 ANU Chess Festival was the ANU University Co-op Bookshop Canberra Club Challenge. It was for teams of 2 players playing blitz (G/5m) in a 5 round swiss. Last years event was for club teams but this year it was opened up to any team of two. Apart from a couple of club teams (ANU Scholars, Belconnen Bruisers), there were a number of 'pick up' teams, and overall the tournament was quite strong. The first few rounds saw The Ladies who Blitz (Alana Chibnall and Kayleigh Smith) take a clear lead. However their run was stopped by The Lads (Harry Press and Michael Kethro) in the third round. Meanwhile the Pawn Grabbers (Elwyn Teki and William Booth) recovered from a round 2 loss to The Lads, to also take a share of the lead. In the final rounds the Pawn Grabbers scored 2 wins over the Belconnen Bruisers (Stephen Priest and Cam Cunningham) while The Lads dropped a crucial point to Just Met (Damien Van den Hoff and Leron Kwong). This left the Pawn Grabbers in front by a point, with The Lads taking second. Third on countback were The Ladies who Blitz, ahead of defending champions the ANU Scholars (Jeremy Reading and Miles Patterson). The whole event was more about fun than blood, although the Pawn Grabbers were pleased with their victory. King O'Malley's provided the venue free of charge, and while their regular patrons weren't quite sure what to make of it, a good time was had by all. Got caught up with FIDE Anti-Cheating work last night, meaning I missed a blog post. But I awoke this morning to see the following battle from the current Politiken Cup. The guy with one of the coolest names in chess Tiger Hilarp-Persson up against one of the coolest guys in Australian chess, Junta Ikeda. The game looked to contain trademark play from both sides, with Tiger sacrificing a piece for lots of pawns and play, while Ikeda kept finding tricky moves in the materially unbalanced ending. Eventually Ikeda found a nice way to draw, sacrificing his last piece for a Bishop and wrong coloured rook pawn ending. The Politiken Cup in Denmark has always been a pretty big event. This years tournament is being held just before the Olympiad, and as a result a number of players are stopping en route to Norway. In fact four fifths of the Australian Open team, along with the team captain are taking part, and all seem to have got off to a good start. IM Mouthun Ly, FM Junta Ikeda and FM Anton Smirnov are all on 2/2, while GM David Smerdon and FM Manuel Weeks (Team Captain) are on 1.5. As the field is a very large 314 players, there are still a few rounds before the real battles start. However such a hit out against a high quality field will help the team get into form before the Olympiad starts. The website for the tournament is very nice, and not only contains live coverage, but also replayable games as part of each players personal page. The first event of the 2014 ANU Chess Festival, the Canberra Club Challenge, is on this Friday (25 July) at King O'Malley's in Canberra City. The event is 'teams-of-two' five round blitz event. Last year was a round robin, with teams from each of the clubs in the ACT, but this year it is open to more teams. However a few of the clubs have already put together some strong teams, with the ANU Scholars looking to defend their title. The competition kicks off at 5pm on the 25th July at King O'Malley's, City Walk, Canberra City. There is still space for a few more teams, and there is no cost to enter, the top 2 teams will win prizes from the even sponsor, the ANU Co-Op Book Shop. Spectators are more than welcome to come along and cheer for their favourite team. You can also still enter the ANU Open which starts on Saturday 26th July. Online entries can be made here, while you can pay at the venue on the Saturday morning. Fabiano Caruana has dominated the Dortmund Classic, winning the event with a round to spare. He has finished on 5.5/7, winning 4 games and drawing 3. On the 'Live' list he has pushed his rating over 2800 (after 6 rounds), and has moved into outright third on the FIDE Rating List (behind Carlsen and Aronian). The last round of the tournament is still being played (the Leko - Caruana was the first to finish), so minor placing are still up for grabs. Caruana secured first place by defeating English No. 1 Michael Adams in the 6th round. Despite facing the topical and solid Berlin Ruy Lopez, Caruana was able to keep pushing until he won a pawn, and then broke through with his kingside pawn majority. The 2014 British Championships has just kicked off, in the last half hour of this post. This year it is being held in the difficult to spell (and pronounce) town of Aberystwyth in Wales. It doesn't look as big or as strong as last years event in Torquay, but that had the attraction of being the 100th Championship. For a number of years the event has been purely British affair, after a number of complaints about the tournament being dominated by players from other commonwealth countries (who were previously allowed entry). However a few 'colonials' sneak in, including Justin Tan from Australia. I assume he gets in on residency as he has been living in the UK for a couple of years. If you visit the tournament website you can catch live coverage from the Championship, as well as the results from the large number of subsidiary events that make up the whole event. A novel twist on speed chess, and one that does not involve using a clock. Chess pieces made out of ice, via a set of moulds shown here. I guess you lose when all your pieces melt, although I'm pretty sure the use of the oxy-torch in the picture is probably illegal (although the laws of chess do not have anything that *specifically* prohibits setting fire to the board). Such a set might actually survive multiple games in Canberra at the moment, given the morning temperatures. But combine it with Drinking Chess and you might be onto a winner eg Frozen alcoholic pieces which are consumed after each capture. However the board might have to be bowl shaped to capture all the melted bits at the end. With around 2 weeks to the start of the Chess Olympiad the big news is the exclusion of the defending Women's Champions Russia from the event. They aren't the only team missing out (8 other teams, mainly from Africa are also excluded), but they are certainly the most high profile. The reason given by the organisers is they missed the deadline to nominate their team members, and under the regulations, are not eligible to play. FIDE have already protested this decision, but ironically, the organisers a quoting FIDE's own Olympiad Regulations as a basis for this decision. The regulations set out various deadlines for countries to enter teams, and for the actual members of the teams to be nominated. In Russia's case it is believed they held off nominating a team until the transfer of Kateryna Lagno from Ukraine to Russia went through. However this happened after the deadline for team lists. Of course if they had been a little smarter, they probably could of nominated another player, and then simply replaced her with Lagno before the start, as the regulations do allow this. In the end this case, and the case of the other missing teams, boils down to which regulations are being followed. There are a number of regulations that cover the Olympiad (including one the gives the FIDE President a great degree of power in making on the spot decisions), so there are a few to choose from. It is hardly surprising then that the organisers are going to rely on regulations that support their case, while FIDE will use different ones. Nonetheless I assume it will all be sorted out before the start, with the Russian team (and maybe the others) being allowed in, as in the end, a little 'behind close doors' discussion usually delivers the preferred outcome. Despite taking up the Dutch Defence as a New Year resolution there are still some after effects of previous years play hanging around. I've had a few long running CC games in progress, and given they started last year (or so I think) the Gruenfeld was the opening of choice. And having just been hammered in my most recent game to finish, the decision to abandon the Gruenfeld still looks like the right idea. A puzzle I have come across in a maths book, re-imaged as kind of a chess problem. The picture to your right is actually a pig sty, divided into 64 sections. The pigs are the white pieces, while the black pieces are aliens you wish to catch the pigs. Each alien can move 1 square either horizontally or vertically, while each pig can move to any adjacent square (including diagonally). The Aliens get to move first. When the aliens first try and catch the pigs, they find they cannot. The two questions are: What are they doing wrong? and What strategy should they use to succeed? We've just finished the meeting of the FIDE/ACP Anti-Cheating Committee, and there was just enough time to catch the end of round 2 of the ACP Golden Classic which is being held in Bergamo, Italy. The game that attracted most interest was the Sutovsky v Jobava game, which Sutovsky won with a crushing attack. 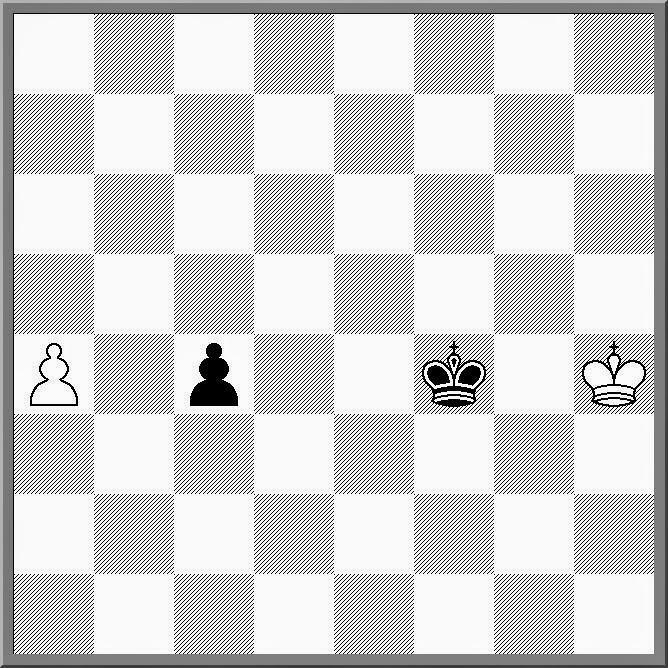 Jobava certainly did not help his cause, where an offbeat opening resulted in a position where he left his king in the centre. An enterprising knight sacrifice from Sutovsky ripped open the centre and some accurate calculation was enough to finish the game. While am in Italy I will certainly get a close up look at the 2014 ACP Golden Classic, which starts tomorrow in Bergamo. This is the second edition of this event, with the first being held in Amsterdam in 2012. One of the reason the tournament has the word 'Classic' as part of its title, is that it is the only top level event that has adjournments as part of its schedule. After 5 hours of play, one player is asked to seal a move, and then the game continues in the rest day (after rounds 3 and 6). The ability to sleep sitting up is considered a talent by some people I know. Indeed a number of years ago one public servant colleague of mine said that if he could sleep sitting up, work would be so much better. I have seen the odd chess player demonstrate this talent as well, although I assume not deliberately. The late Paul Dozsa was known to fall asleep at the board on occasion, and at a recent Sydney International Open there was a player both sleeping, and softly snoring. Where such a talent would really come in useful is on long haul international flights. I am writing this while sitting in Abu Dhabi Airport, having just hopped off a 14 hour flight from Sydney. I'm pretty sure I got my usual 4 hours of airplane sleep, but I never really know. I am on my way to Bergamo, Italy for a small meeting of the FIDE Anti-Cheating Commision, which will take place over the weekend. Then it is back on a plane on Monday to repeat my sleeping experiments. With the closing of Australasian Chess there has once again been a gap in the local chess magazine market. But like previous gaps, this one has been pretty short, as there is a new chess magazine on the scene. "50 Moves" is an electronic magazine produce by a group of young Australian chess players. The first issue is being launched on the 1st of August and is covering the lead up to the 2014 Olympiad. After that there will be an issue every two months and it promises to cover all the major Australian events as well as providing a smorgasbord of other chess related content. The magazine also has its own website, 50movesmagazine.com where you can subscribe, as well as seeing a preview of what the magazine will look like. On of the contributors is FM (and soon to be IM) Junta Ikeda, who is handling Studies and Problems. One of the problems featured in the first issue is the one shown in the diagram. It is White to play and win, and like any good study, what is both the winning move, and the winning line is immediately obvious. The title of this post is the French term for what is known as 'staircase wit'. 'Staircase wit' is thinking of the perfect retort far too late for it to be of any use. Occasionally this kind of thing occurs in chess, although not via verbal exchanges. It might be described as the 'staircase sacrifice' where you realise that you could have played the winning move three moves ago, but by now the opportunity has passed. I had this experience this evening in rapid game at the Belconnen Chess Club. I played a hack line against the French and was rewarded with Ng6+, which wins and exchange due to mating threats down the h file (NB This is the second time I have pulled off this trick in the last 2 months!). But having won the exchange I needed to keep working. I though that h6-Qg5, aiming for Qf6 was strong, but after my opponent played his knight back to g8 I decided to head in another direction. 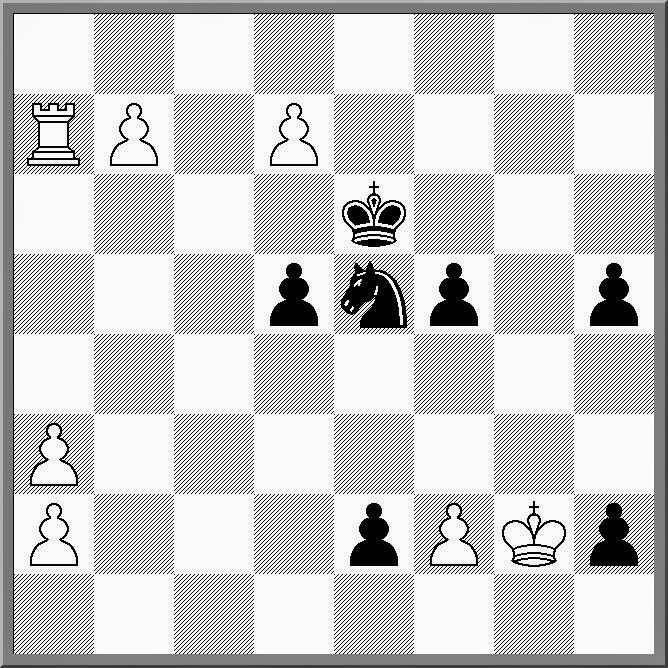 It was only after a played Bb4+ that I realised that Qxg6 had been on for a number of moves! Of course it would still work if my opponent played Ke8, but a few seconds after I realised what I had missed, Kf7 was played instead. Fortunately I still had a material edge, and was well up on the clock, but my eventual win was far less convincing than it could have been. Image you find an abandoned chess board while walking along a beach. You pick it up and give it a rub, and suddenly a genie appears. "Hello, mortal" she says in quite a load voice. "I will grant you one, chess related wish". "One" you say, "what about the other two". "Budget cutbacks" she says, "there is a bit of a wish deficit at the moment". "And to make it worse, you only get to choose between two options". Realising this deal isn't as good as you'de been lead to believe by 1960's sitcoms, you simply shrug your shoulders. "Your choices are: Your will never play anything worse than the third best move in a position or You will never play a move that makes you position worse by more than a half pawn"
Assuming the genie is on the up and up, and the power of the wish will always assess the position correctly, which option would you prefer? Top seed IM Gary Lane has won the 2014 Oceania Seniors Championship. He finished a half point ahead of second seed FM Bob Smith, and a point and a half ahead of Jeff Cabilan in third place. Going into the final round Lane and Smith shared the lead, but Smith drew with David Lovejoy, while Lane beat Karel Hursky. The tournament attracted a good field of 38 players, which indicates that Seniors Chess (50 years and over in this case) is a potential chess market, although past experience has shown that it mainly works as a stand alone event (ie when it is not held with other open events). Full results and a collection of games can be found at the tournament website. On his way to victory Lane won a number of quick games, including this brevity. Late night TV* return to my house, with the start of the Tour de France. In fact the start of this years event was even more interesting as it began in the French city of Leeds (in Yorkshire). Having spent a few weeks in that part of the world last year, there were plenty of familiar landmarks as the cyclists sped bye. In fact one of the first villages they went through was Pool-in-Wharfdale, home of my PNG teammate, Rupert Jones. After that Otley was the next destination, home of one of the best Milkshake shops I've ever been too. However like last year, the middle part of the race will be a little confusing for me. I have a very brief trip to Italy for work with the FIDE/ACP Anti-Cheating Committee, so the fact that the race will be on during the day will be a little disconcerting. Of course it is unlikely I will see much of the race anyway, as there is more than enough committee work to fill in the time. If you are reading this sometime tomorrow, I would suggest you try and catch the highlights of today's stage, as it really does show off Yorkshire, especially the wide open spaces that you miss when visiting urban Britain. The Elephant Gambit is one of those openings which has the benefit (like the Latvian Gambit) of being almost guaranteed to appear once your opponent has played 1.e4. Of course it has the drawback of not necessarily being completely sound, but like any opening, specialist knowledge may make up for its shortcomings. I'm not sure if the following game counts as a 'model' game in the opening, but it does demonstrate some of the key ideas (a lead in development and targets on the kingside in return for pawns). And the finish is quite good, as Maroczy tosses all his pieces bar his queen to engineer a checkmate. A direct link to the documents is here. The 2014 Asian Club Champiomships has ended with a victory to the all GM team from India PSPB. They came into the event as rating favourites, and finished with 13/14 (6 match wins and one draw). In second place was Tagatay Chess Club from the Philippines (+4=3), with Kazakhstan Tokkata third (+5-0-2). The team representing Western Sydney finished in 6 place, with 4 drawn matches. An extra half point in the final round against the back makers from Bangladesh would have moved them up a spot, but they were still happy with their finish. The team performed closely to their ratings, and both IM Max Illingworth and IM Gary Lane went close to a board medal (which were awarded on PR). Chief Arbiter Brian Jones reported that the event ran smoothly, with the organising team putting on quite a show. Each round seemed to start with a series of photographs with the visiting dignitary of the day, while how the event was presented (in terms of venue layout), was of utmost importance. You can see the final results, as well as plenty of pictures from the tournament, at the official website. As a little weekend project I decided to put 5 years worth of Street Chess events onto the web (For those that don't know, Street Chess is a weekly rapid tournament held outdoors in Canberra). Although Street Chess has been running for 20 years, it was only in the last 5 years that there was an almost complete set of electronic data. The data was generated by the Swiss Perfect pairing program, and was extracted and formatted by a python program I (mainly) wrote. The tricky bit is getting the data out of Swiss Perfect,as it uses a not quite 100% correct implementation of the xBase format (old dBaseII!). There was around 500 lines of code, and it does a directory walk, to generate a web page for each tournament. I've also generated some basic player statistics as well, although there is still some work need on that. The finished product is at http://members.iinet.net.au/~shaunpress/streetchess/ with a link to each event, as well as to the player stats. Doing a quick look at the stats, the busiest player is Miles Patterson, with 875 games over 125 tournament. His points tally of 580.5 is also way out in front. Probably the most successful player (of players with more than 10 events) is FM Endre Ambrus with a score of 93%. In the 384 games he has played, he has lost only 20, while winning 348. Of the female players WIM Emma Guo scored an impressive 75%, while Alana Chibnall was the busiest with 84 tournaments.